Need a Part Number? Select your spring for the job from our tables. Knowledge is power. Learn design details right here. ​The proper use of disc springs as a modern design element permits substantial economies by size reduction and maximum utilization of energy and space. Disc springs are precision belleville springs made of high carbon spring steel, alloy steel, stainless, and heat resisting steels and non-ferrous materials. Conical in shape and made to special geometrical relationships of OD,ID, thickness, and height, they are subject to exacting manufacturing and quality control standards. Material used are generally in annealed condition and hardened to range of RC44-51 depending on material thickness used. Load/deflection relationships are closely controlled. Disc springs are made of cold rolled strip, hot rolled sheet, or forgings of flat or conical shape. After the spring is formed by stamping, it may be machined at the inner and outer diameters or on all surfaces. When properly designed and used, disc springs have a long life, superior performance, and may result in significant cost reduction. Power transmission components such as clutches, brakes, transmissions, etc. Valves, piping and drilling tools. Hoists, cranes and heavy engineering applications. Electrical switch gear and bus bars. Founded in 1966, Fan Disc Corporation was the first known U.S. firm to begin manufacture of a full program of standardized "DIN" disc springs made available from stock. We manufacture and stock the entire DIN range from 6mm OD through 260mm OD. We also make many special sizes to customer drawings and have made springs with OD to 40"(1000mm). Materials generally employed are C1075, SAE6150, Stainless 1717PH(AMRCO), Inconel X718, and Monels. Fan Disc Corporation manufactures a wide range of belleville and disc springs products in our modern, 100,000 square foot, fully equipped office and manufacturing facility, located adjacent to the Burbank Airport on a 100 acre industrial site. Fan Disc is recognized as a leading design and application company in the field, and was selected by PD&D magazine for PRODUCT OF THE YEAR 2000. Fan Disc is ISO 9001:2015 certified. We optimize the design of springs through several strategies, including patented design techniques. By choosing a spring or washer that exactly matches your application, you save money. 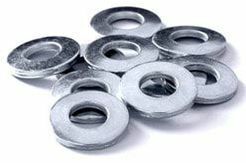 You could be wasting money working around an existing spring or washers deficiency. Talk to our staff about your needs. Let us quote your job! We have automated and fine-tuned our process, assuring that each spring or washer is made with the best possible parameters. We record machine events and errors, both improving operator awareness in real-time, and providing long-term quality. We are proud to offer products MADE IN THE USA.